Letchworth State Park, with some of the most magnificent scenery in the United States, comprises 14,350 acres along the Genesee River. Within the park, the river roars over three major waterfalls, one of which is 107 feet high! The cliffs, created by the river's path over thousands of years, approach 600 feet. 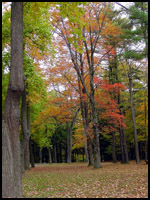 A multi-faceted park, Letchworth offers opportunities a wide variety of interests. Millions of years of geological history can be observed in the rock formations exposed by erosion. The region's rich heritage of the Seneca Indians is well documented in the park with displays, a restored Seneca Council House and the grave of Mary Jemison. Swimming pools, fishing areas, hiking trails, hot air ballooning, whitewater rafting and canoeing by permit are just some of the additional attractions at Letchworth. A full schedule of events is offered each year within the park. They range from concerts to lectures to guided walks, to the noted Fall Arts and Crafts Sale. 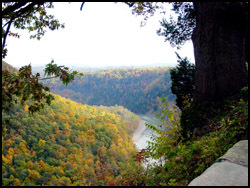 Letchworth State Park is the largest and most diverse park of nine state facilities in the Genessee State Park and Recreation Region, one of eleven park regions administered by the New York State Office of Parks, Recreation and Historical Preservation.